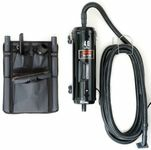 At AutoBarn we carry portable vacuum, hand vacuums, wet/dry vacuums and heavier duty vacuum. Dust would not stand a chance. Browse through our selection of hand held vacuum cleaner by brands such as Black and Decker, Metropolitan vacuum, Wagan, and more!